Above + Beyond volunteers Hannah Roth, Becky Finch, Carolyn Gaidis, Frank Eppert, and Paul Todd Merrill were recently recognized by the USGBC Heartland Region as Volunteer Superstars! 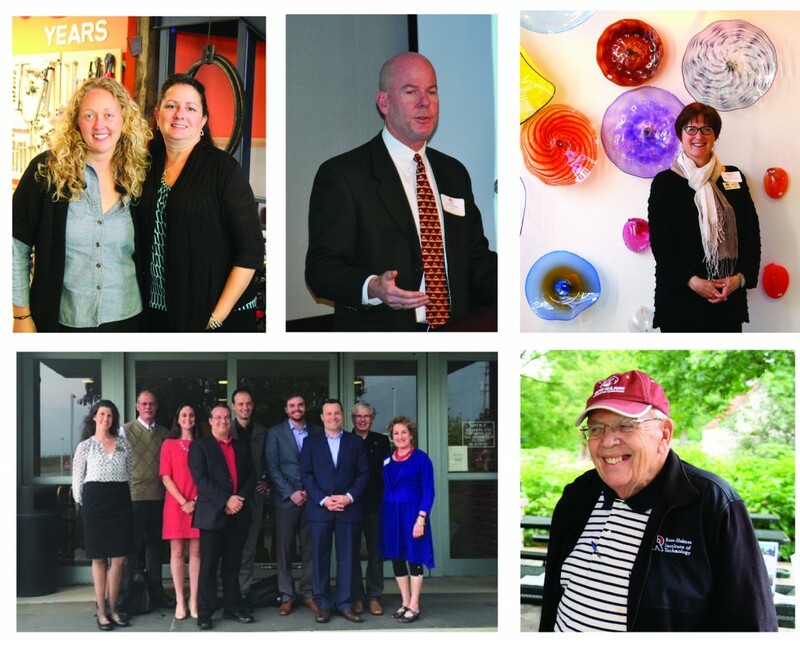 We were thrilled to recognize each of these volunteers through our Above + Beyond program, and are excited to see these volunteers recognized regionally as well. Many thanks to Becky, Carolyn, Frank, Hannah, and Paul for all of their work on behalf of the Chapter! Frank Eppert, USGBC-MO Gateway Technical Committee, LEED Community Project and Green Schools Quest, AFRAM Corp.
Josh Campbell with MEI and Gail Parson with E2 discussed their Clean Jobs Missouri survey results. Check out their presentation. Ashok Gupta with the Natural Resources Defense Council talked about the importance of good policy as a driver to move the market and comply with the clean power plan while meeting environmental objectives and lowering customer costs. Specifically, Gupta drew on his experience with the City Energy Project, most recently in Kansas City, MO. Warren Wood with Ameren Missouri described energy efficiency as the lowest cost resource in their portfolio, with every $1 investment generating $3 of benefit. He also discussed the benefits of their current and proposed energy efficiency incentive programs. Check out his presentation. Doug Sitton of Sitton Energy Solutions wrapped up the panel with an overview of how his company & his customers have benefited from energy efficiency. Not only are most customers typically seeing 25 – 25% energy reductions with 5 year paybacks, but Doug also anticipates that we have just begun to see the benefits of energy efficiency in this region. 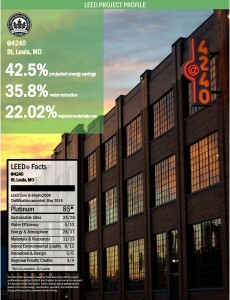 LEED Platinum @4240 in St. Louis’s Cortex Innovation Community is the latest LEED project to be featured in a USGBC-Missouri Gateway Chapter LEED Project Profile. With 85 total points, the project earned Platinum in LEED Core & Shell v2009. Energy Efficiency measures incorporated into the project are projected to result in a 42.5% energy savings compared to a typical lab/office facility. Additional sustainable design features include the development of activity-based green space, Low Impact Development techniques to manage water runoff, native plantings, and creative reuse of original building elements. Learn more about the building’s sustainable strategies, the project team, and @4240 in the project profile, or visit our Local LEED Projects page to learn more about LEED buildings in our Chapter territory. The U.S. Environmental Protection Agency’s ENERGY STAR Portfolio Manager is an online, interactive energy management tool that allows you to measure and track your building’s energy and water consumption, identify investment priorities, and verify improvements over time. Get hands-on assistance using the free, online ENERGY STAR Portfolio Manager tool at the October 27 Benchmarking Blitz! All buildings benefit from benchmarking: businesses, schools, congregations, non-profits and local governments are encouraged to attend. 12 consecutive months of utility bills for all fuel types used in the building. You will need the number of units of each energy type used, not just the dollar amount of the utility fee. Attendees that register by October 20 can receive assistance collecting this data from Ameren Missouri and Laclede Gas. Key operating characteristics for each major space type. FEE: Free to all. Please pre-register using the link below. REGISTER: Online Registration is now closed. In-person registration will be available at the event. to use ENERGY STAR Portfolio Manager. Experience with the free, online tool is required. To participate, select “Benchmarking Volunteer” when registering. Participants can self-report their participation for 2 GBCI CE hours in the volunteer category. QUESTIONS? Contact USGBC-Missouri Gateway staff at usgbc-mogateway@mobot.org or (314) 577-0854.